Family Camp is a time to relax, try new activities, meet wonderful people with similar interests, and speak or practice French. The groups are often a mixture of ages — sometimes three generations. Family members can be as busy or relaxed as they want — all activities are optional, the pool is open morning and afternoon, and the tennis court is always open. You can bring your camera for some excellent photography, go for quiet walks through the forest, sit on a mossy promontory and enjoy the sunset, or be busy every minute of the day with kayaking, sailing, tidepool investigations, archery, cooking, or art. 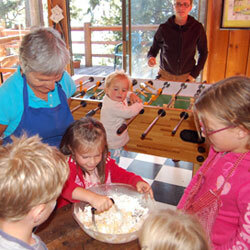 We discuss on Friday evening what activities families are interested in and tailor the program to their preferences. Each family has its own tipi with five beds with mattresses, an electric light and a wooden box for storing personal items. We model these weekends after our summer camp: singing la Marseillaise at the flagpole, learning a French proverb as the mot de passe to enter the dining hall for meals, reading the menu, asking for food to be passed in French, and singing French songs after lunch. 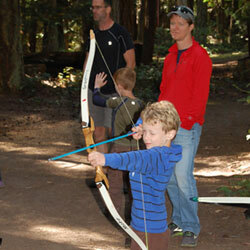 This is a great way for potential campers and parents to find out about activities and the camp facilities. Adults attending alone or with friends are also welcome, and the island is a great place for an inter-generational outing or family reunion. With many different levels of French present, the program is also in English. We offer beginning and intermediate classes and French games for little ones for one hour after breakfast and encourage French speaking among participants and our instructors. Pre-breakfast kayaking is available each morning. Families arrive Friday late afternoon or evening, and leave the last day either in the morning or afternoon. Meals will be provided from Friday dinner through the last day lunch. Program participants may not bring pets to Canoe Island. According to ADA requirements, a service animal is defined as a dog that has been individually trained to do work or perform tasks for an individual with a disability. The task(s) performed by the dog must be directly related to the person’s disability. For example, a person with diabetes may have a dog that is trained to alert him when his blood sugar reaches high or low levels. Under the ADA, the dog must already be trained before it can be taken into public places. Generally, the dog must stay on the floor, or the handler must carry the dog. The service animal must be harnessed, leashed, or tethered while in public places unless these devices interfere with the service animal’s work or the person’s disability prevents use of these devices. In that case, the person must use voice, signal, or other effective means to maintain control of the animal. The dog must be under the handler’s control at all times. If a service animal is out of control and the handler does not take effective action to control it, or if it is not housebroken, that animal may be excluded from Canoe Island.